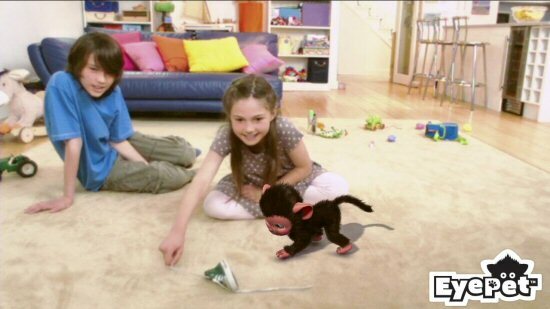 EyePet is a family-friendly interactive experience that utilises the PlayStation Eye. With the motion-sensing camera set at knee height and pointing towards the floor, a small section of your living room appears on-screen and becomes the area in which you interact with your new pet through a series of hand-wiggling gestures. EyePet also includes a “magic card” that you use to complete a variety of objectives. You pick up the card and point it at the camera, which then appears to transform into a variety of objects, including the likes of a baby’s bottle and a shower-head. You can then tilt and move the magic card in front of the camera and your actions are translated on-screen. Similar to the Nintendogs experience, EyePet is all about tending to the needs of your creature, giving him the required love, exercise, food and stimulation - as if he was your own child. Designed to appeal to young children, the ape-like creature that appears to bound around your living room reacting to your commands is very cute with his big eyes, endearing noises and playful manner. You get the opportunity to make him look even more cute, or ridiculous, by dressing him up and customising him in a variety of outfits. EyePet starts off life as an egg and the motion-sensing fun begins when you have to hatch it by virtually rocking it back and forth. On-screen it looks incredibly realistic, like you’re interacting and touching your pet, but you're actually just flapping your hands at thin air. The gameplay revolves around objectives and the Pet Programme, where you’re assigned with completing daily tasks in order to unlock items, games, costumes and further objectives that do well to blur the boundaries between gaming and reality. Objectives range from giving the EyePet a shower by pointing and tilting the card over his head, to feeding him cookies by using the card as a cookie jar and pouring them into his mouth. There are dozens of activities you can do with your EyePet, such as wiggling your fingers in the air to make him jump, stroking him to get him to sleep, or making him leap over your hand. As you progress through the objectives things start to get even more bizarre and interactive and you'll learn to play ball with your pet, exercise him with a virtual trampoline, or even play bowls with them. EyePet will really start to freak you out when he starts to sing songs back to you and copies images that you have drawn onto paper. He'll them turn them into a 3D object. Imagine drawing a plane on a piece of paper in your living room, watching this clever chimp copy it, and then jump in the pilot seat and fly around your room. Bonkers.